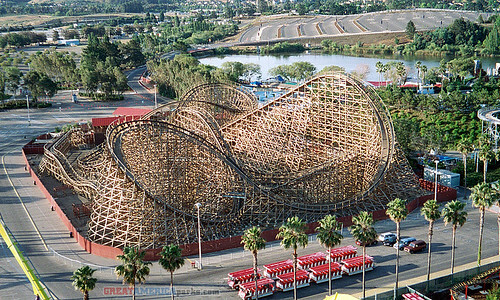 (Vallejo, CA) – May 1, 2009 – Six Flags Discovery Kingdom will celebrate the 10th anniversary of its wooden roller coaster, Roar, on Saturday, May 9. The 95-foot tall coaster has delighted over 6.8 million riders and cycled approximately 283,333 times since its opening in May 1999. Manufactured by Great Coasters International, Inc., Roar which has a top speed of 50 mph, taking riders along a 3,467 spiraling track that features six reversals, 22 crossovers, 17 turns, 12 drops – all this with a G-force of 3.5. In recognition of the milestone, Mayor Osby Davis and the Vallejo City Council are proclaiming May 9 as Roar’s 10th Anniversary Day, on behalf of the City of Vallejo. Individuals interested in participating on behalf of Roar’s 10th Anniversary will be able to sign up to ride as they enter the park between the hours of 10 to 11:30 a.m. on Saturday, May 9. The exclusive ride time will take place on one of two Roar trains during the event hour. Six Flags Discovery Kingdom is open Fridays and weekends through May 22, after which the park will open daily for the summer through August 23. Operating hours vary. Season Passes are still available for the value price of $49.99 plus city fee through May 25, 2009. Season Passes can be purchased in-park, online or through SaveMart/Lucky stores. For additional information on operating hours, rides, shows, special events and to purchase tickets, please visit www.sixflags.com/discoverykingdom .